Spend an interactive workshop with Guy Parsons as he coaches you on how to apply value-stream mapping, a fundamental and critical tool, to address what many companies find difficult to do: making a fundamental change in business processes such as administrative, professional, and transactional activities. You will see how the key elements of lean thinking and value-stream mapping apply to such activities by identifying key processes to tackle by creating a visual representation of your current operating condition and then applying lean principles to envision a leaner future-state for the process that can be sustained. Guy is the co-author of Mapping To See, a complete training solution based on the value stream improvement project experience of some of the most seasoned veterans working in lean today. You will be exposed to the process and tools contained in this book which have been developed over hundreds of projects in virtually every industry. His teaching is designed to bring this proven approach to office, manufacturing and service environments in companies of all sizes in the most cost-effective way possible. Through the early years of understanding Lean and how Toyota managers thought, many organizations could “see” the tools of Lean. Tools we would recognize as Just-In-Time, Continuous Flow, 5S and many others. Through the 1990’s organizations focused on eloquently implementing of the tools, or technical aspects of Lean; only to find the organization operated better but hadn’t really improved. In the first decade of the new millennium, we began to understand the people side, or social aspects of a Lean Transformation. As we dug in more to the history of the creator of the Toyota Production System, Taichi Ohno, we learned that he created tools for the purpose of engaging the workers of the organization to think and solve their problems. The “tools” were tools to stimulate and create “learning” for people to solve problems! 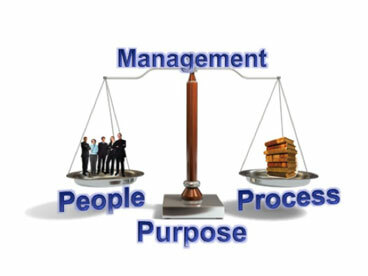 We are developing an understanding that joining the People, or Social side of Lean with the Process Tools, or Social side of Lean is the underlying support of the Management aspects of Lean. And all this works for one Purpose, deliver Value to the customer! The illustration to the right depicts this balance we work toward in our organizations. 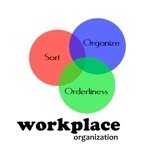 Workplace Organization: Applying the concepts of Sorting, Organization and Orderliness to the business or production process workplace. Normally thought of in terms of physical goods, the concepts also apply directly to the system and thought processes. Significant “wasted time” is spent looking for materials, information, supplies or people. Assuming you know what the problem is without seeing what is actually happening. Assuming you know how to fix a problem without finding out what is causing it. Assuming the action you have taken to fix a problem is working without checking to see if it is actually doing what you expected. How do Lean Leaders lead? The keys to lean leadership are reviewed and discussed. As a leader, creating a learning organization that continuously identifies and solves problems quicker than its competition creates a competitive advantage. Leadership takes on the role of teacher encouraging and enabling the workforce to understand processes and improve them. Learning To See and Mapping To See teaches how to look at Value Creating processes from beginning to end regardless of the departments or functions the process crosses. Based on this view, a visual representation, “map” of the process is created. These maps focus on the information and work flows to build Value Stream maps which are our blueprints to guide our Lean Transformations. Strategy Deployment focuses on aligning the organizations Purpose, Processes and People to deploy the strategies determined to be critical to the organizations success. While organizations work on Value Stream Improvement Projects and kaizen events, the organization does not achieve the success of a Lean Transformation. Strategy Deployment focuses on the planning process incorporating A3 Thinking to teach how to define clear and aligned actions, focus resources and involve and motivate the organizations team members. Creating a system by which anyone can see at a glance “normal” from “abnormal” conditions of the process. Visual Management helps anyone know the current operating condition of the process. The proper implementation of Visual Management is critical to successfully implementing Quality and Standardized Work, as a standardized process must be repeatable to be able to see normal conditions from abnormal conditions at a glance. Teaching the concept of continuous work flow and balancing work between the process steps to eliminate waste; waste being defined here as excessive hand-offs, back tracking, rework and waiting for approvals. Work Flow will help the learner understand the importance of looking at the Value Creating process as a stream of work from beginning to end as an alternative to looking at work as processes with departments of the organization. This learning will introduce the concept of designing the process to match the pace of the customer demand. Pull and Replenishment are thought of in terms of physical goods; however, doing work before it is required in any process is a form of waste. This concept reviews the development of holding the right amount of work, or inventory, in a process and signaling when to replenish consumption. This concept is tied to work balancing to optimize the amount of capital or resources required to operate a given Value Creating process. Lean is often misunderstood as a NO INVENTORY system. Lean Thinking is in practice a Right Amount of inventory, in the Right Place at the Right Time system. Quality is dependent on reducing variation in processes and consistently repeating the result. Standardized Work is the principle, which teaches the concept of repeatability. Standardized Work is the basis for improvement, for without a basis to evaluate a new process; we have no knowledge if the change will improve the process and therefore the business condition. Change without measure is chaos; changes with measured improvements are results. Measurement is the defining and controlling of the inputs to processes to achieve the desired results, or metric, of the process. Measurement is the “C” in Plan-Do-Check-Act. Measurements as defined in this module will consist not only of end of process measurements; measurement of results, but of inputs to processes that we must monitor and control to achieve results. We at Value Stream Solutions understand the need to align the Transformation efforts moving forward with those that have occurred in the past. Our interest is to build on the foundation you have established; whether beginning in the Board Room or deep in a business/service/factory process, we will help you map your course.